The potentiometers on the gShield are setting the Vref (Voltage Reference) level on the TI stepper motor driver chips. This determines the current limit for the driver. You can measure this voltage at one of the potentiometer pins (see photo) and adjust it to obtain a given current limit. Use great care as the potentiometer pins are very close to other components and it is easy to short the pins together with your meter probe. Really bad things happen. The gShield (version 5) uses a 0.1 ohm current sense resistor so the formula is Vref = 0.8 * I. The maximum current the driver chip can deliver with appropriate cooling is 2.5 amps. 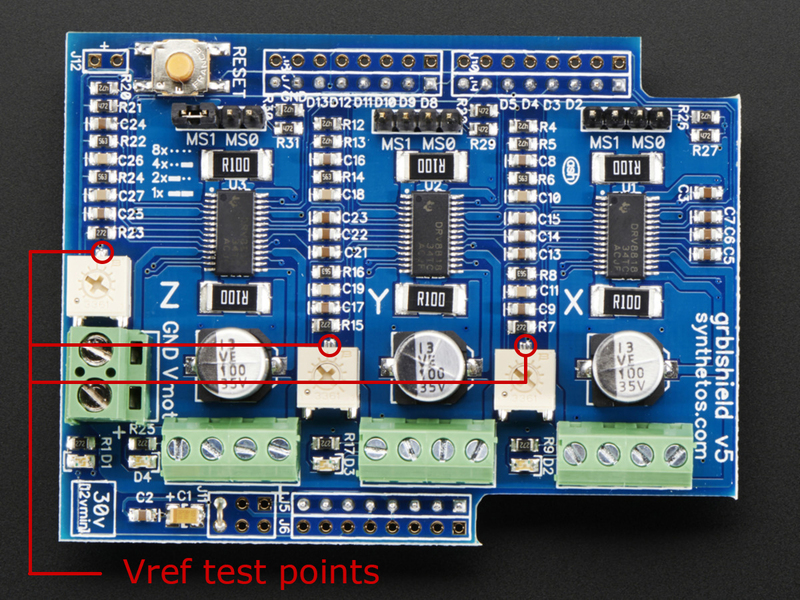 To use this current value you would set the Vref voltage at (0.8 * 2.5 amps) = 2 volts. This is the theoretical current limit. The NEMA 17 motor (part #25253-01) that Inventables sells has a maximum current rating of 1.68 amps per phase. To set the maximum current limit for this motor you would set the potentiometer to (0.8 * 1.68 amps) = 1.34 volts. It should be noted that the maximum current a motor can handle is not necessarily the correct setting for the motor. Stepper motors will operate at a lower current than maximum, with a corresponding reduction in torque. You don't want to exceed the maximum current per phase of stepper motor as doing so will damage the motor. Also, check out Robert's video on how to set the motor current limit by the sound of the motors as the machine operates. There are a lot of repeated questions and answers on here, and some good videos that explain everything. I've got 2 maintenance and one X-axis stiffening video that I made that may help with some X-Carve maintenance and troubleshooting. Since a picture is worth a thousand words, videos have got to be worth a few more. If you've got a video, or like a video someone else has, put it up on here. Let's make a collection that will be easy to reference for various X-Carve users! Help: Router not following SVG outline? Unable to complete any basic project. Random "crap out". Help? Consistent tracking issue with projects...help! How fast have you pushed your machine? This is excellent information. I feel like this should be in the setup instructions. This is very useful information if one has the NEMA 17 motors. I've got the NEMA 23 motors and can't seem to find any information via forum searches on what voltage the potentiometers should be set at for the NEMA 23s. Perhaps someone could point me to that? Found the specs on the motors on Inventables. The NEMA 23 motors apparently have a maximum current of 2.8 Amps. But the drivers are limited to 2.5 Amps. 0.8 x 2.5 = 2.0 volts which should be what's measured on the gShield potentiometers. I set mine at 1.9 to be a little on the safe side. If you drive the chips that hard you may get thermal shutdown. The 2.5 amp rating is for "adequately cooled" chips. With just the 24 volt fan you may not have enough cooling to get 2.5 amps. FWIW, I only raised the voltage setting for the Y-axis motors. That seems to have cured the grinding noise and slightly-out-of-sync motion between the two Y-carriages. I would try it at about 1.6 volts to give a current of about 2.0 amps. If you don't have any issues with it set there then I would leave it there. I run mine a little lower than that, but I have the 500mm unit with the NEMA 23s.